A prevalent snake, the mighty boa constrictor has the largest distribution of all neotropical boas. Their natural habitat ranges from northern Mexico down through the Caribbean Islands, all the way south to Argentina. These pink, tan, gray and brown beauties possess characteristics unique unto themselves that not only differentiate them from other reptiles, but also from other snake species within the same family. Though boa constrictors seem huge when compared to most other snakes, they’re actually one of the smaller members of the Boidae family, which includes the massive anaconda. The largest boa constrictor ever measured came in at 18 feet, but most adult boas measure around 13 feet long and can weigh more than 100 pounds. Surprisingly, females are usually larger than males, though males may have longer tails. Perhaps the most unique physical feature boas possess is their pelvic spurs, or “hind leg remnants." Males use these externally visible vestigial legs, which look sort of like little spurs, during courting. Boa constrictors have unique heat-sensing pits and scales on their faces that allow them to detect prey when they hunt at night. They’re carnivores but aren’t exactly picky with their dietary choices. Boas eat rodents, monkeys, birds, wild pigs, mice, lizards, amphibians and even bats. A boa constrictor’s small, hooked teeth grasp and hold prey while its muscular body and strong coils wrap around the victim until it eventually suffocates. Their jaws unhinge from each other and stretch large enough to swallow their prey whole. A boa constrictor’s slow metabolism means it doesn’t have to hunt and forage all that often -- it can go two weeks without a meal. Boas are excellent, fast swimmers but prefer to spend their time on land living in hollow logs and abandoned burrows or lazing about sunbathing when it gets chilly. If a predator such as a crocodile approaches, the snake's patterned body allows him to camouflage into the surroundings. 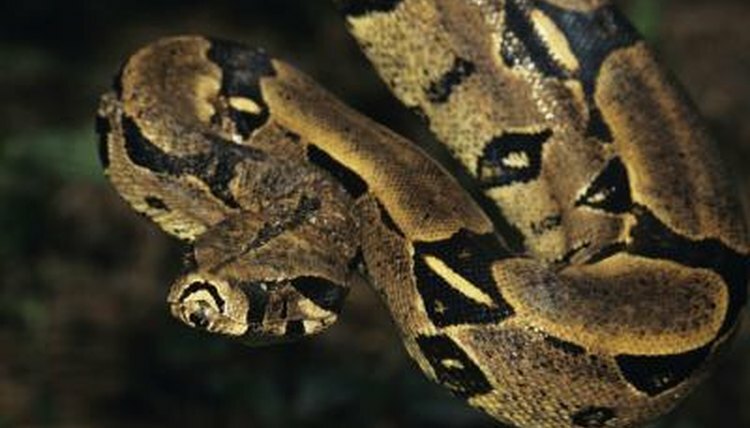 Boa constrictors also use sound warnings to ward off predators or danger; their loud hiss can be heard from 100 feet away. Some of the longest-living snakes around, boa constrictors can live to be 35 to 40 years old, reaching sexual maturity around age 2 or 3. The male boa constrictor uses his pelvic spurs to grip the female during mating and both males and females have several partners during a mating season. Baby boa constrictors develop within eggs inside their mother’s body, but instead of hatching outside, they hatch inside her body. She gives birth to live young. The number of offspring from one female boa constrictor can be anywhere from 10 to 64.